We go through salsa pretty fast at my house. 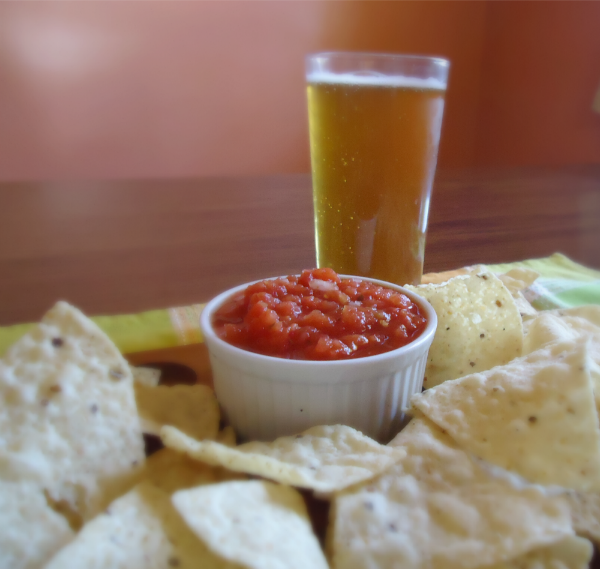 Hubby and Son both love to snack on chips and salsa when they get home from work to stave off their hunger pangs until we’re able to get dinner on the table. I decided it would be a good idea to find a quick and cheap way to stir together our own salsa. I tried making salsa totally from scratch by cutting up my own tomatoes, but that was more time consuming and too often the salsa turned out watery. I came up with this version using canned tomatoes and both Hubby and Son have made a point of telling me how much they like it, so I must have done something right! Combine all ingredients and refrigerate for at least a few hours before using to let the flavors mingle. You can also pulse the mixture in a food processor a few times if you want a less chunky consistency. You may also wish to drain some of the liquid off the cans of tomatoes before stirring them together if you want less “wateriness” in your salsa. Sometimes it can be hard to find the diced tomatoes with green chilies in the 14.5 oz size too. When that happens, I just use the smaller size can and it still turns out great. This is one of those wonderful recipes that doesn’t require much measuring after you’ve made it a few times. I dice about a half of a small onion, a teaspoon of dried cilantro is about a small palmful, and 1/4 teaspoon of crushed red pepper flakes is about a pinch or two. This recipe makes a quart of salsa. A quart canning jar with a plastic screw lid makes a good container for storing the salsa in the refrigerator. Peppers freeze very well. I use fresh jalapenos for my salsa and chop all of them then store the extras in the freezer. I just toss them in frozen next time. They are small and thaw in no time. Even the frozen ones make salsa taste very fresh, even when made from canned tomatoes. I grow them in the garden. Just a plant or two is enough to keep us in salsa all year, and they grow well in pots, too. I often add a small can of tomato juice, too. I found it makes it so much better without making it watery. So glad you found the recipe both helpful and tasty. Had a nacho all made and our salsa was moldy – remembered this recipe and it saved the day. Recipe is very easy and delicious.